Vinyl runner floor mats, rolls for floor protection, corrugated and diamond mat rolls for wood and gymnasium floors, warehouse and industrial flooring. hardwood, laminate and marble floors. Runner floor matting provides a protective element for wood floors, especially gymnasium floors-from the harsh repetitive contact of shoe heels. Over the months shoes can damage, discolor and scar all types of flooring, even concrete floors. 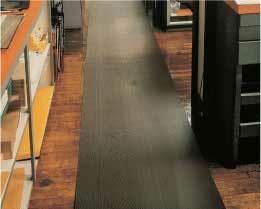 CWF Flooring, Inc. floor mat runners rolls add a visual accent to rooms, warehouses, and offices areas. With a variety of colors and textures your work, industrial, home or play areas can appear more professional, industrial and comfortable with runner floor mat rolls. Whether the purpose of your runner floor mats is a ten feet long mat roll that leads into your home garage or a mat that is 105 feet long that directs employees into the manufacturing plant, CWF Flooring, Inc. can meet your home, office, industrial or warehouse needs. 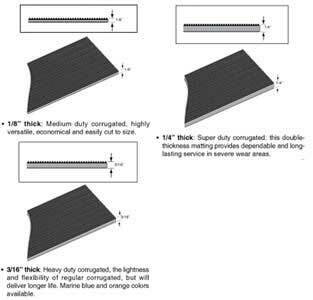 This smooth runner mat (pdf) roll is designed for moderate floor protection where mild foot traffic occurs. Thicker mats will improve floor protection. Uses include floors in workstations and shelves. An other option for runner mats are the 1/4 Inch smooth rubber rolls up to 200 ft. long is another option. A 200 ft long roll by 4ft wide of rubber would weigh 1360 lbs. Consider that disadvantage (1360 lbs. @ 1.7 lbs. per sq ft) ) when relocating the rolls. But for durability, a quarter inch rubber can withstand heavy weight such as pallet-jacks, dollies, and even cars. 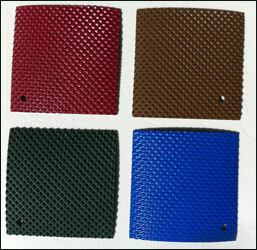 Free runner mat samples. Mat Size Wt. Lin. Ft.
3’ Wide’ 1.5 lbs. $5.92 lin. ft.
4’ Wide 2.0 lbs. $7.93 Lin. ft.
3' Wide 3.0 lbs. $10.21 lin. ft.
4’ Wide 4.0 lbs. $13.59 lin. ft.
A vinyl runner mat textured with embossed diamond-plate designs the anti slip backing will meet your safety requirements, floor protection and aesthetic needs. 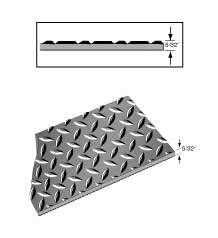 Diamond plate design offers exceptional wear in heavy traffic areas. Oil and chemical resistant. Spilled beverages are simple to remove. Motor Safety Standard and Flammability Test Approved. 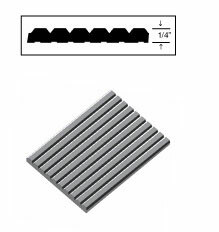 This corrugated runner mat is popular because it make sweeping, cleaning and general maintenance an easy task. Quarter inch thick. 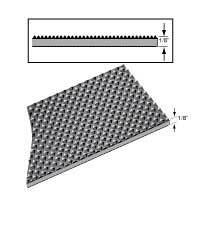 The textured mat surface will minimize falls due to the anti-slip properties that corrugation supplies. Minimizes slipping in heavy foot traffic environments such as locker room, production and assembly lines. For thicker mats please visit CWF Kitchen Floor Mats. Engineered to resist repetitive abuse. Tritan Runner Floor Mats guarantees years of floor protection and fine appearance. This Runner Mat is Highly Textured and Will Beatify Industrial Areas. Our 3/16" thick Pyramid Floor Mat Runners has a cross-grain surface for sure footing for safety in addition to floor protection. Reverse side is embossed for added slip-resistance features. Grease, fat and oil resistant. Available In White and Up to 105ft. Long. Easy Clean Runner Mats is vinyl-ribbed mat, resilient, long lasting and nice-looking. Chemical and acid resistant. Heavy-duty. Meets flammability Test requirements of Motor Vehicle Safety Standard No. 302 (49 CFR 571.302). Stain and abrasion resistant. 5’ x 105’ 3.20 lbs. Will add superior floor protection for all high foot traffic environments. Provide easy removal of dirt and mud from constant foot traffic. These floor protecting mat rolls will floor you! 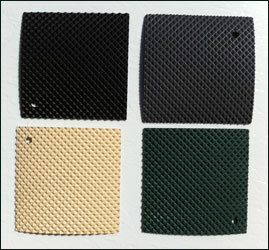 Floor Mat Runners Color Options: 1/8" Black, 3/16" Black, Orange, Marine Blue. 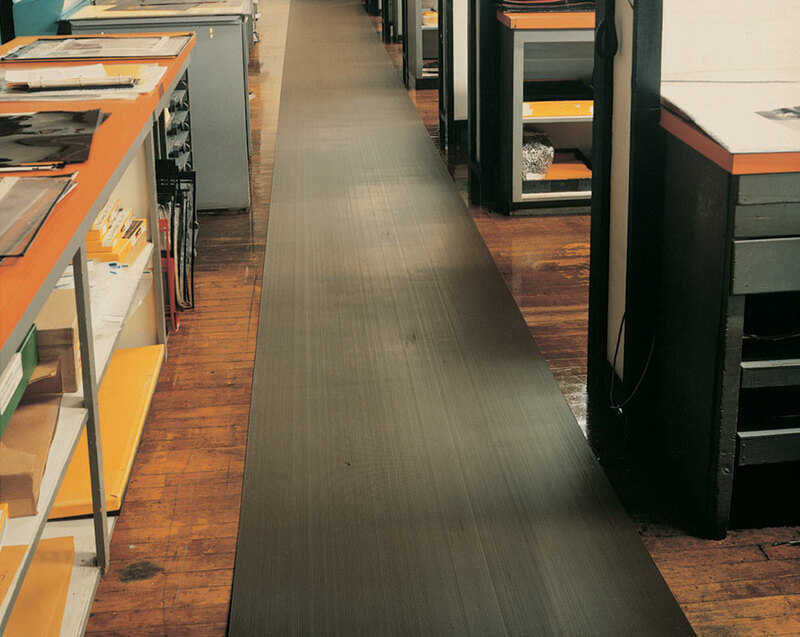 The Corrugated Runner Mat is the standard mat for warehouse floors, runways for industrial applications and all high traffic areas.